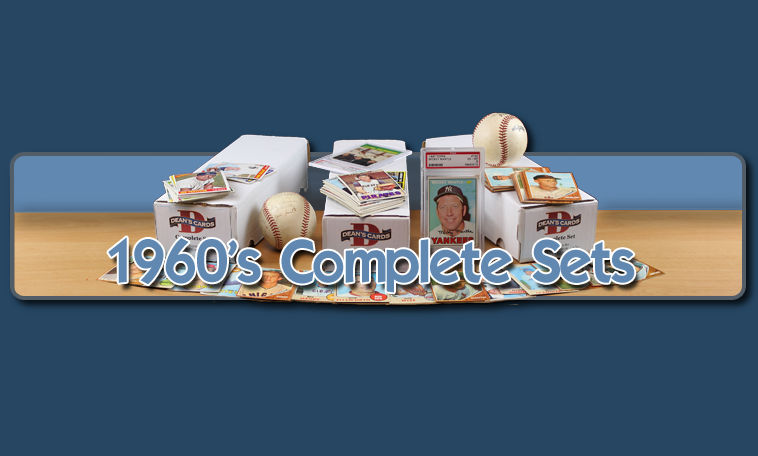 The Topps Complete Sets, from the 1960s, are some of the most popular vintage baseball card sets to collect. Each of these sets is built from our 1,000,000 card inventory, using advanced technology that we developed. Scans of the set's ten most valuable cards are shown in the listing. You can also see huge scans of the front and back of each card in the set! Each of the sets has a detailed listing of the number of cards in each grade, along with the set's Average Grade and Weighted Grade. The Weighted Grade of a set gives a truer picture of the overall condition of a vintage baseball card set, as the more valuable cards have a greater effect on the sets average condition. For example, a Pete Rose Rookie Card, with a value of $2000 - would have a weight 500 times that of a 1963 Topps common card with a value of $4. CLICK HERE if you want to sell your 1960s Topps Baseball Card Complete Sets cards. Showing 1 to 38 of 38 products.